By tracking monthly expenses and computing savings rate over time, it can become crystal clear if your finances are moving in the right direction. Written by Adam on August 7, 2017. Updated April 24, 2019. 2 min read. Financial Independence. 21 comments. This is a graph of my savings rate over time. By savings rate I mean the simple formula: total amount saved / total amount earned. This will always be a percentage between 0% and 100% if you’re saving money, or below 0% if you’re dipping into savings. In my case, I consider anything unspent at the end of the month to be savings, so it’s not specifically money that was invested. Each month I track this in a simple spreadsheet. This allows for doing the basic blue line here — SR over time. It varies wildly though. What’s not clear from this chart is vacations we had, honeymoons, a wedding, paying off some joint debt, paying off a new car and even a windfall (well the timing on the windfall is a little obvious). When looking at this blue line, things seemed to be OK. I knew I was spending a little more lately, but nothing crazy right? I didn’t feel like I was letting in lifestyle inflation. I decided to try adding one more column to my spreadsheet around “trailing 12-month savings rate” which was an average of the SR from the 12 months before that given month. When I graphed this line I was completely surprised by the result! I hadn’t been saving quite as much as I thought — and the trend wasn’t looking good. Doing this activity was great for helping me get a gut check and realize I need to reign in my spending a little. Looking forward to seeing that red line go up in the coming months. 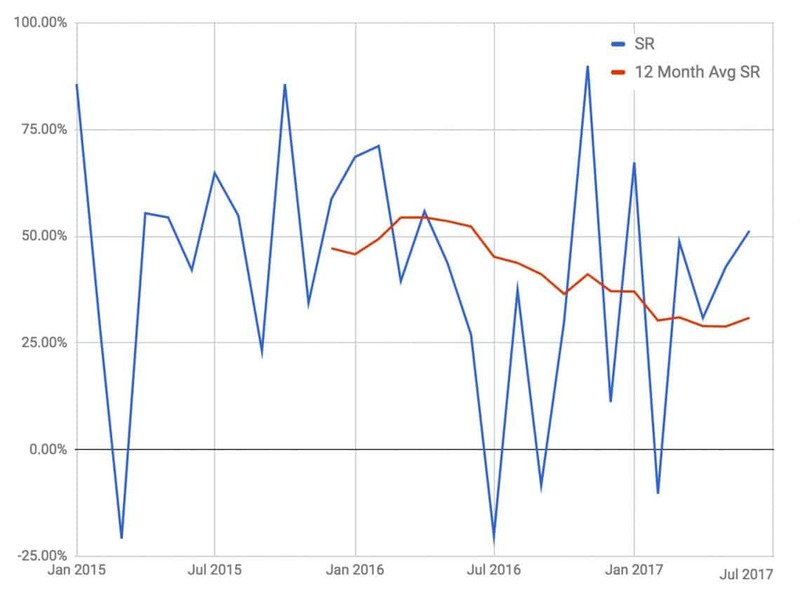 Thanks for sharing – and love the idea of the trailing 12 month savings rate – it’s something I haven’t really looked at before, only what my last month was, but not the overall change. I will be adding it to my spreadsheet! Awesome, glad you found it interesting! Be curious to see what your findings are once adding that in. I love this. I always thought that savings rate was good, but seeing it trend on a graph really makes it click. I think I’ll do the same! Awesome, thanks! I’ll be curious to see your takeaways after seeing it visualized. I just calculated and got similar result. The good news is that I was in positive savings territory. The bad news, I let consumerism get the bets of me at times. Great exercise! Thanks for sharing. Ahh nice. Did yours have a ton of wild swings month to month too? I’ve found that to make it more difficult to understand this without seeing the trailing 12 month trend line. Yes, sir I did experience wild swings primarily due to the timing of incentive compensation payouts, irregular spending months, taxes et al. It certainly brings it more into perspective by doing it your way. Those negative months really bring down the average. At least now you know. Good luck bring your SR back up! Thanks Joe! On the bright side, I added in July and it’s already trending up since then. Hoping to get back up to a consistent 50% like last year. Oooo I really like this idea! With a graph like this you can clearly see how you’re doing each month. Sometimes we convince ourselves that we’re saving more than we actually are, so this would keep us honest and on track with our goals. Thanks! I was convinced my SR was higher than it was. Definitely cleared things up. I’ve used the 6mma, it’s a little more responsive, but eh, who knows – maybe the smoothness of the 12mma is better. Anyhow, I do like this output because it’s hard to see trends from such noisy data and a total trendline takes outdated numbers into consideration and isn’t as helpful. Ohh, that’s a good catch! I added another mention about when it’ll be below 0% (when dipping into savings). Smart decision about your savings rate over the last 12 months! We happen to do a small competition in our #BSRI  club to keep us motivated, feel free to join it! Also, I find it interested that your blog is about the intersection of these 3 topics that I cherish (min, mind, FI). I’m currently reading a book about the stages of human consciousness and I plan to write an essay about how I relate it to all these cited topics. Did you already read about such a high level point of view? If yes, I would be interested to share on the topic. The competition idea sounds like a good commitment device/motivation tool for sure. I’d lean towards competing against my past self, but I see how it could be useful for sure. Ohh, what’s the book you’re reading? I’d be curious to check it out. I feel these three topics are highly related but haven’t yet gone too deep into writing about yet. Most of my take on these topics is highlighted at a high level in my about page. The book is “Reinventing Organizations”. I will let you know if/when I’ve done my own research article. Ah nice! Yeah I’d love to hear it. That book looks interesting too — added it to my to-read list. What a great way to put yourself in check! I read a study one time on whether people felt that they were better driver than the average person. Something like 80% of people thought that they were an above average driver! Perhaps those that pursue saving significant amounts of money feel the same way, and believe that they are doing a better job than they are! I will definitely use it to see how my family is saving over time. Sounds about right, if framed as “80% of people think they’re saving more than they used to”. Up until seeing these numbers I would’ve been in that category as well! Great idea on smoothing the savings rate average! I just started tracking my savings rate 3 months ago, so this is very relevant to me…. I just need to get enough data to smooth! Did you say you are counting paying off debt as an expense? I am counting this as savings and counting when I actually accumulate the debt as the expense. This way of tracking rewards paying down debts and punishes the actual purchases that create the debt. Zack – that makes sense and it’s what they taught in financial accounting! Im considering paying off debt as a transfer from an account that lowers checking and raises the CC back up to 0 (its negative when I have a balance on a credit card). Think this sounds similar to your description?